UPDATE: Q2 Radio claims to be 'the world's easiest to use Internet radio' | What Hi-Fi? After showing off the technology at CES in Las Vegas at the start of the year, Armour Home has now announced the launch of the Q2 Radio in the UK. Billed as the easiest to use internet radio in the world, the Q2 radio promises 'to forever change the way people interact with radio'. Armour Home argues that despite all the choice offered by internet radio, many people stick to a handful of their favourite stations. So the Q2 allows you to set your four favourite stations via a set-up procedure on a PC or Mac – a selection that can be changed as many times as you like, naturally. To then change between your chosen stations you simply turn the Q2 Radio cube on to another of its four sides. Similarly, to increase or decrease your volume you tilt the radio forward or backward. The Q2 comes with a rechargeable battery – recharged via mains power – that offers up to 8 hours of life on a full charge. Available from its own Q2 Radio website, the Q2 costs £90 and is available in a choice of five colours. 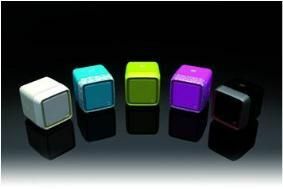 Q2 claims its new cube-shaped ‘Tip & Tilt' is the world's easiest to use internet radio. It has no confusing knobs, displays or dials. Users simply select one of their four pre-set radio stations by tipping the ‘Tip & Tilt' onto one of its four sides. To choose another favourite, simply tip the radio onto another side like a dice. The front side is the speaker and on the rear are sockets for headphones, set-up and charging. Tilting the radio adjusts the volume; forward to turn it down and backwards to turn it up. Easy. "Tip & Tilt's ultra user-friendly and intuitive design makes internet radio fun, liberating it from the desktop and taking it to the kitchen or bedside table," says Q2. The ‘Tip & Tilt', which measures just 4in on each side, will be offered in a variety of colours and will be available from spring 2010. It will be distributed in the UK by Armour Home.